The colors of fall is so beautiful, don’t you agree? 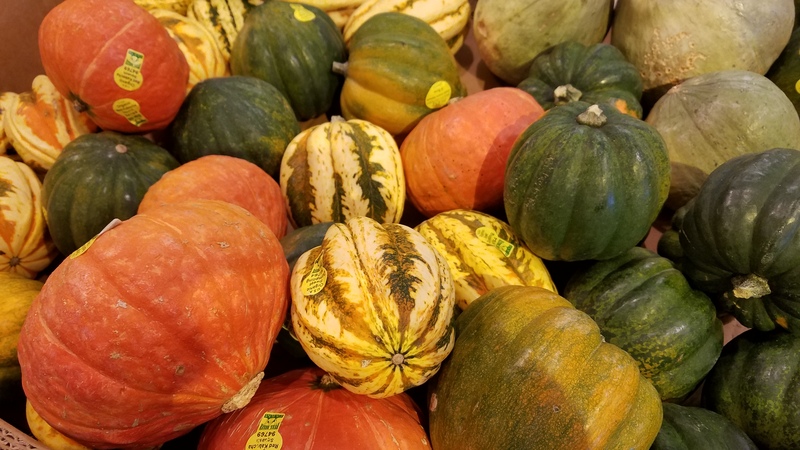 Look at the piles of pumpkins and squash in the store; the hues of red, orange, yellow are so attractive and inviting. 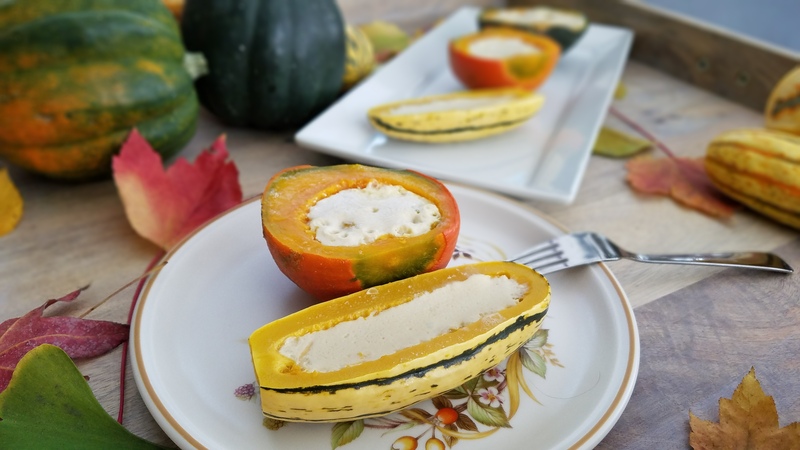 I couldn’t help but to plan a dessert this weekend with these gorgeous squash. 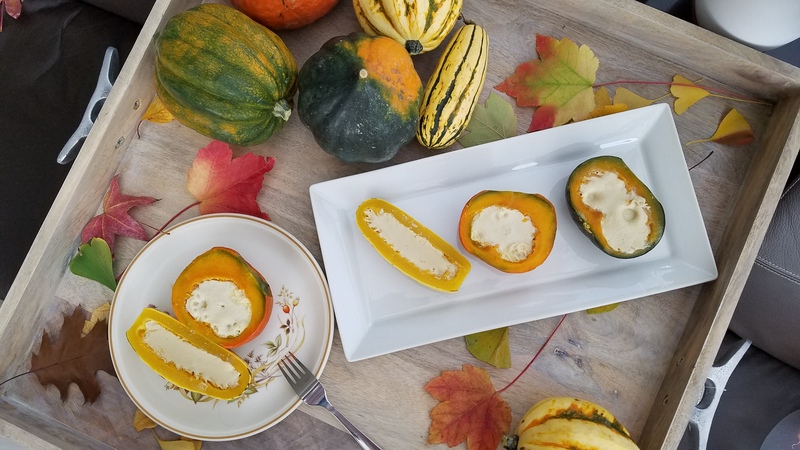 This custard-filled pumpkin and squash recipe is so easy, the hardest part is to cut and seed the pumpkins. Choose the squash about the size of your palm, so that they are big enough to hold the custard, and yet small enough to cut and seed easily. Simple, easy, and delightful. I don’t think I’ll ever make pumpkin pies again! 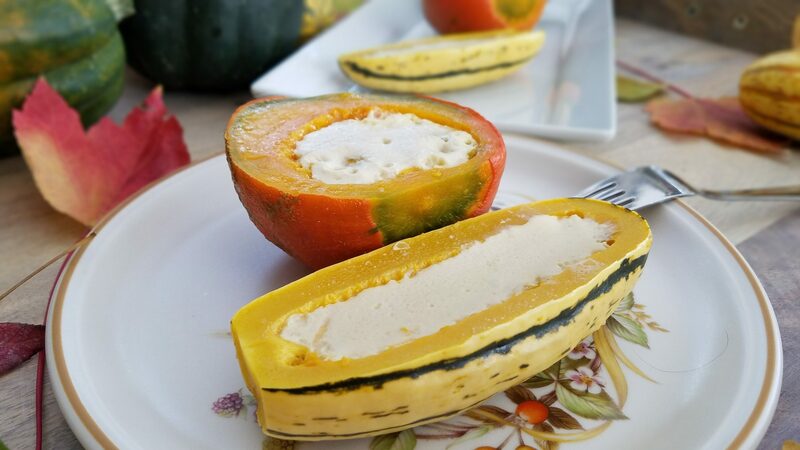 Cut each pumpkin/squash in half and remove the pulp and seeds. Make sure that each half can sit level on the table, cut-side up. Shave a little skin on the back if needed to help stabilize the squash. Melt palm sugar with 1/4 cup water in a medium sauce pan over medium-high heat. Stir in the coconut cream and salt until well combined. Beat eggs lightly in a separate bowl, then add to the coconut cream and syrup mixture. Whisk lightly until combined. Prepare a large steamer and bring water to a boil over medium high heat. Carefully arrange the squash halves on a plate that will fit in the steamer. Set the plate in the steamer. Fill each pumpkin/squash half with the egg mixture up to the brim. Reduce the heat to a soft rolling boil. Cover and steam for 20 minutes until the custard is set. Cooking time varies with the size of the pumpkin. Test that the custard with a wooden skewer, it should come out clean from the center of the custard. Remove from the steamer and cool. Drizzle some maple syrup and garnish with a sprinkle of ground cinnamon.